Neale Donald Walsch’s book series Conversations with God has developed from self-help topics to broader ones, concerning humanity as a whole. In this interview with Dr. Michael Laitman, Neale Donald Walsch discusses how today humanity should be recreated as a brand new organism, as a group instead of a scattering of individuals. Dr. Michael Laitman put the question across, how can people unite today? Walsch rephrased the question as, how can we make people understand that we are already united? Laitman and Walsch agreed that humanity’s lacking consciousness of its unity is the greatest problem in the world. Moreover, they agreed that humanity’s experience of separation from one another is the cause of all personal, social and global-scale problems people face. Walsch raised the idea of organized religion being a major area of separation among humanity. Dr. Laitman responded that it won’t help to attack religion, but that as a result of the knowledge of humanity’s unity spreading, people will gradually start understanding problems inherent to organized religion from within themselves. Moreover, Dr. Laitman mentioned how religious writings and people’s opinions about them are totally different, that religious texts write about developing relationships of love among people, and that the law of nature is revealed to people through such relationships. 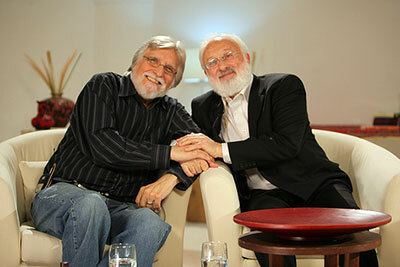 Dr. Michael Laitman interview series with Neale Donald Walsch. Neale Donald Walsch is the author of the best-selling book series Conversations With God, and his newest book, When Everything Changes, Change Everything. Ask any of your deepest questions & get it answered live!